The Digimet 3000 Version 4.0 allows users to set limits for pulsator ratio parameters, like a high and low value for the B phase of pulsation. When a user is collecting data with the Digimet 3000, the Digimet 3000 display will blink when a parameter value falls outside the desired limits. This will give guidance to a user as to a potential problem with a pulsator and/or an indication of values that are not appropriate. Existing units are easily modified. Minimum and Maximum limits can be set for Maximum Vacuum per Pulse; A, B, C & D Phases; and Pulses per Minute. A maximum limit can be set for B Fluctuation. A minimum limit can be set for Minimum Vacuum per Pulse. When viewing data in real time or viewing stored data, the values that are outside the set limits will blink on the Digimet display. The Digimet 3000 is a 5-key, hand-held, battery operated, microprocessor- based vacuum and pulsation multi-function meter for measuring vacuum level characteristics and pulsation attributes in the dairy milking system. Use the Digimet 3000 for vacuum testing critical variables within the milking system. Useful in finding vacuum leaks, plugged lines, and pulsator phase monitoring. With the Digimet 3000, you can store data and recall it at a later time. The Digimet 3000's stored data can be either viewed on its LCD screen, uploaded to a computer or printed to the Digimet Printer. By monitoring vacuum levels, pulsator ratios, milk/rest ratios and pulsation electronics, the Digimet 3000 can evaluate system performance and improve milking efficiency. Accepts pneumatic and electrical input. User selectable shut-off from 0 to 30 minutes of non-use. Battery life of approximately 40 hours. Save five 10-second graphs with data collected at 125 Hertz. NEW! Display blinks when Pulsator parameters are outside user set limits - (see explanation above). Units measured may be inches of Hg or kPa. Transfer stored data from the Digimet 3000 to a computer via a serial or USB connection (USB connection with user supplied USB to serial conversion cable). Print stored data to the Digimet Printer. The New Digimet 3000 Printer is supplied power by a wall transformer. The unit does not have an internal battery. A Spanish language version of the Digimet is now available. Our carrying case is made from black fabric material and is padded similar to a camera case. Its dimensions are 8 1/2 inches in length, 5 inches in width and 4 1/2 inches in depth. The front compartment has a nylon zipper and is for the Digimet unit. There is a second compartment on the back side which is also zippered and is for accessories. 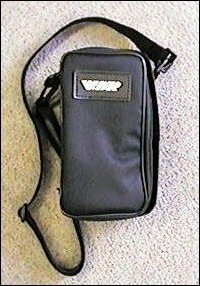 The carrying case is included with the Basic Digimet 3000. 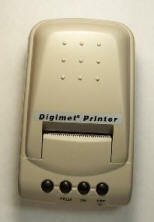 The Digimet Printer unit consists of the printer and a voltage wall adapter. The printer can only be used by connecting the wall adapter power source (120 VAC). The paper roll and printer ribbon are stored within the printer enclosure. The NEW Digimet 3000 is the perfect tool to check vacuum levels and pulsation attributes in your dairy milking system. The Digimet 3000 is a timely answer to the demand for efficiency and cost-effectiveness in today’s dairy operation. One can now spot-check critical variables within the milking system, save the data to a computer for historical review or print it out using the Digimet Printer for a quick printed record of the system's variables. Let’s examine a couple of reasons why a dairy farmer or a dairy equipment dealer would want to use a tool like the Digimet 3000. Reason #1: The vacuum gauge still reads the same near the receiver jar, but when two machines are being applied to the cows there seem to be more instances of squawking liners. Here’s a good use for your Digimet. Take a look at the vacuum at the teat end by plugging the Digimet's vacuum tube into the area around the claw. Maybe the vacuum has dropped below that vacuum level necessary to hold the teat cups on the teats. Reason #2: You’re just not sure if all your pulsators are working properly. Well, it’s not going to be a quick or easy job, but once in a while you’ll just have to get the pulsator ratios of all your pulsators. Look at the ABCD phases of pulsation or take a look at a graph, print it out and analyze it. Save it in your computer until your dealer has time to take a look at it. There just is no other way to catch a failing pulsator. And the Digimet is perfect for this job. Reason #3: With the NEW Digimet 3000 Version 4.0, your dealer or your equipment company can give you the proper parameter limits that your pulsators should operate at. Then input those parameter limits into the Digimet 3000 Version 4.0 and when reading real-time data from your pulsators or reading saved data stored in the Digimet 3000, the parameters that don't meet or exceed the limits set, will blink. This will make it easier to determine whether something is wrong or not. Reason #4: Use the Digimet to check "decay time" on automatic take-offs (ATO’s). For this purpose you will use the Store Graph feature in the Vacuum Level Function. Go to Store Graph, then choose a storage slot, label it or not, press the Menu key, then choose graph time of 10 seconds. At this point, Don’t press the Enter key until you are set up on the milking machine with the cow milking. Use a needle to plug into the short milk hose of one of the inflations and connect to the Digimet. While the cow is milking, put the ATO into manual. When the cow is milked out, press the Enter key on the Digimet immediately prior to pushing the removal button on the ATO. The Digimet will graph the next 10 seconds. When viewing the graph, at the point that the vacuum line drops vertically, this will indicate the vacuum level that remained in the teat cup at removal. Reason #5: Let's say there is a discrepancy between the pneumatic pulsation ratio at the milking unit and what the perceived ratio should be. One item to check is the electronic output at the main pulsator box. Using the Digimet 3000, the banana clips provided and the Digimet electronic input ports, one can check the electronic output (12VDC to 24VDC) at the pulsator box to see if it matches the pneumatic ratio. Reason #6: An item that is many times overlooked is whether or not the vacuum shut-off valve on the automatic take-off unit (ATO) is working properly. This test would be done while the vacuum system is on, but the milking unit is off and just hanging at the milking station. Configure a way to hook a needle or a "T" up so that you can use the Digimet 3000 to check for the vacuum being leaked into the milk hose. For example, a needle inserted into a rubber cork that would fit into the end of the particular size of milk hose being used would suffice. Pull the milk hose off at the claw, plug the open end with the cork and then check for any vacuum with the Digimet 3000. If the shut-off valve is closing properly, no vacuum should be detected in the line. If the shut-off valve is leaking, a vacuum reading will appear on the Digimet's display screen. Use the Vacuum Level Function for this test. Other uses for the Digimet 3000: In the Digimet version 3.4 and greater, one can check for Limping between the two sides of a pulsator. When storing pulsation data in the Dual mode, after collecting data on both sides of the pulsator, for example, 01A and 01B, the Digimet 3000 calculates the Limping Ratio for that pulsator. It indicates the difference in the A+B phases of the two sides of the pulsator, in percentage and in milliseconds. The newest version of the Digimet 3000 is version 4.0. This shows on the screen of the Digimet when you first turn the Digimet ON. Two computer software programs accompany the Digimet 3000. One of them is a DOS program called Upload.exe and the other is a WINDOWS program, called digidata.exe. Retrieve a two page data sheet on the Digimet 3000 Version 4.0. Click below or the Digimet 3000 Operator's Manual - 4C.